Released on PC last year, Max Payne is yet another example of a successful and well thought out PC Port to the PS2. Naturally enough you are Max and the game is played out through the third person perspective. Controls are intuitive and easy to learn and graphically the title is as strong on the PS2 as it was on the PC. Max lives in a city of drugs, desperation and corruption which eventually leads to the death of his wife and child and it is at that point that Max starts his own particular war on crime. 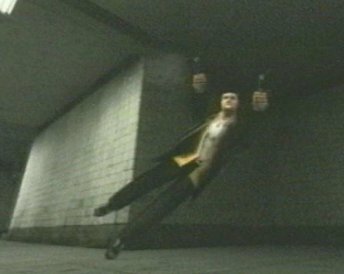 Featuring for the first time in a game, "Bullet Time" was one of the many amazing effects used in the blockbuster movie "The Matrix". You can slow down the gameplay and use your time effectively to dodge bullets and rapid aim at multiple enemies. Deaths are treated in a very cinematic John Woo fashion with slow motion death scenes showing the full force of the method of dispatch. Definitely not a title for the younger gamers among us. Take2 Interactive can rest assured that they are releasing a high quality title with Max Payne. The only minor fault was inability to save where you liked, save points being the way the game progressed. Fortunately though, these save points are fairly abundant and you shouldn't have to play through too much to catch up. The only other minor point is that the title really has no replayability, once you have finished, you have finished, unless you enjoy the New York Minute option which gives you naturally enough, a minute to get through an area. 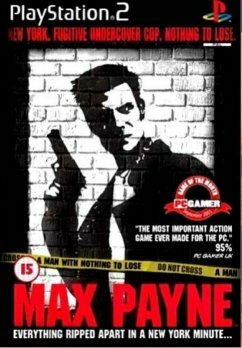 Max Payne is a great, over the top violent game with an engrossing storyline and unique character progression through the graphic novel format and is a great addition to your PS2 game collection.